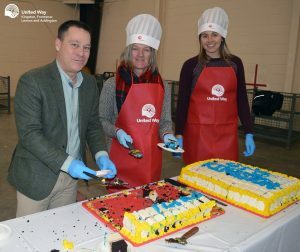 Every year, workplace employee campaigns make up nearly 70 per cent of the funds raised through the United Way Kingston, Frontenac, Lennox and Addington’s annual campaign. Through workplace events and employee giving, workplaces in our community are always supportive through their generous donations and willingness to spread the word about United Way. A question that’s often asked is: what makes a workplace campaign successful? 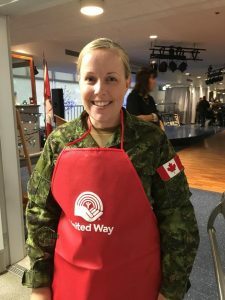 To answer that question, United Way KFLA caught up with Maj. Erica Lidington from CFB Kingston. Lidington was the Employee Campaign Chair (ECC) at the base in 2018 and was instrumental in helping CFB run their most successful campaign to date, raising more than $275,000. Lidington remembers training for her role as an ECC starting back in April 2018 at a peer learning session coordinated by the United Way. She was eager to learn and admits that when she takes on tasks she tends to go above and beyond. 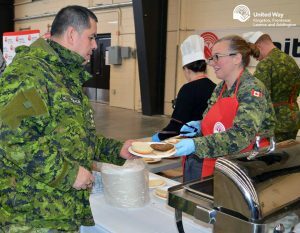 She encouraged unit leaders to approach the campaign in the same way and credits the amount of training and knowledge that each of them gained throughout the campaign as being the key to their success. Throughout the campaign, members of the base also had an opportunity to hear from speakers with lived experience and take part in Seeing is Believing Tours where they heard form organizations first hand and saw where the money they were raising was going. In some cases, Lidington also made an effort to make the need to give even more personal. Last year, the United Way helped over 53,000 members of the community through 42 agencies and 64 programs. For Lidington, this impact and this need to help the broader community is what the campaign and her role as ECC are all about. Lidington also realized that the major part of workplace campaigns is the individual donations that generally happen in the form of payroll deductions, not the big events that we all see taking place throughout the fall. “We have some larger events, but that is not what generated major revenue for us during the campaign. It does keep the momentum going and really keeps the United Way on the radar, but it doesn’t raise big money,” she said. This momentum can be hard to keep up at any workplace, but is especially difficult at CFB Kingston where members may be posted and have to leave mid-way through a campaign. Lidington herself is moving on to a new position this year and as a result she won’t be returning as ECC for the base, but she does have some advice for her replacement and ECC’s across the community.